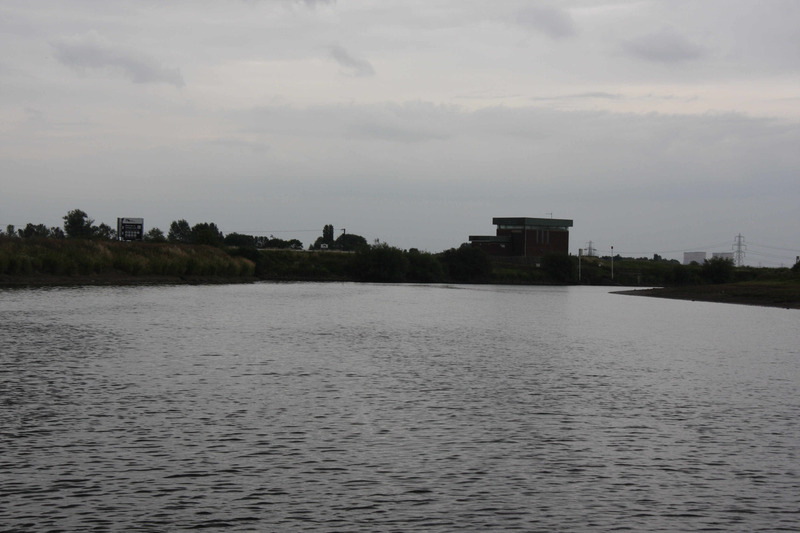 It was a long drop from the basin to the river – we were joining the tideway just after slack water when the tide was just starting to rise. 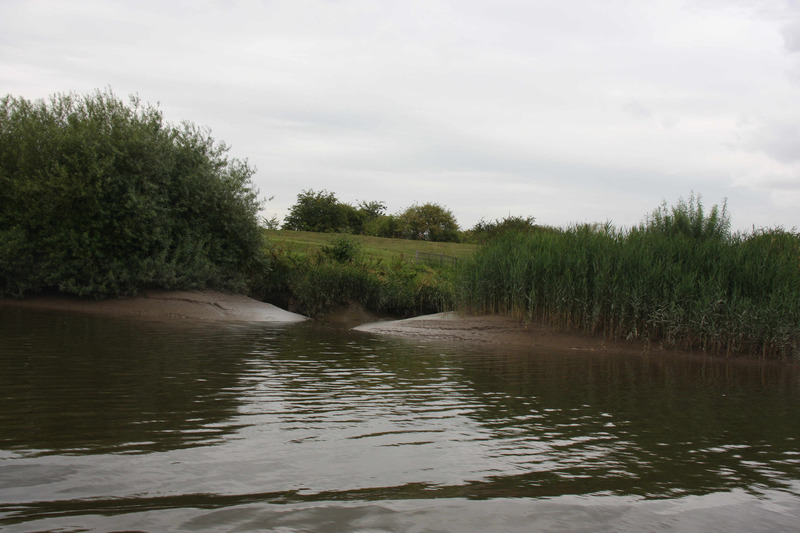 There was no danger of the encountering the Aegir (tidal bore) though – this was the month’s lowest tide and there was very little flow upstream. 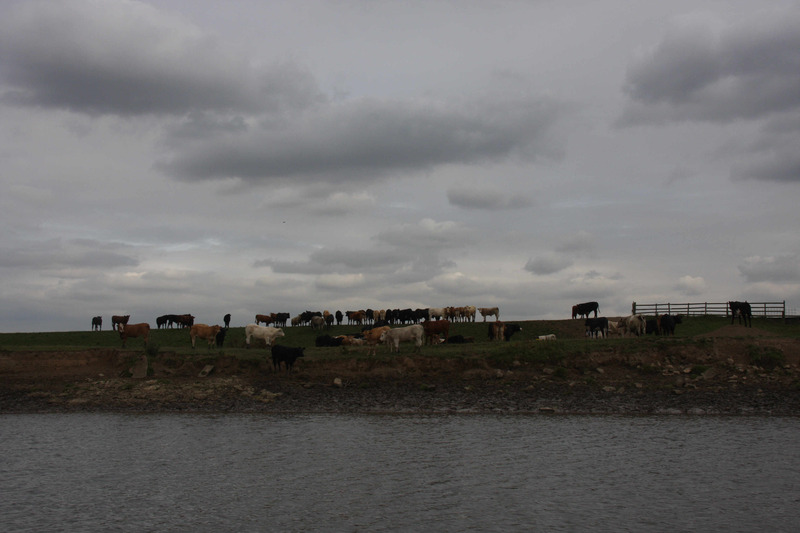 We turned upstream and thought that we’d see the big craft that had passed earlier, but it had disappeared. 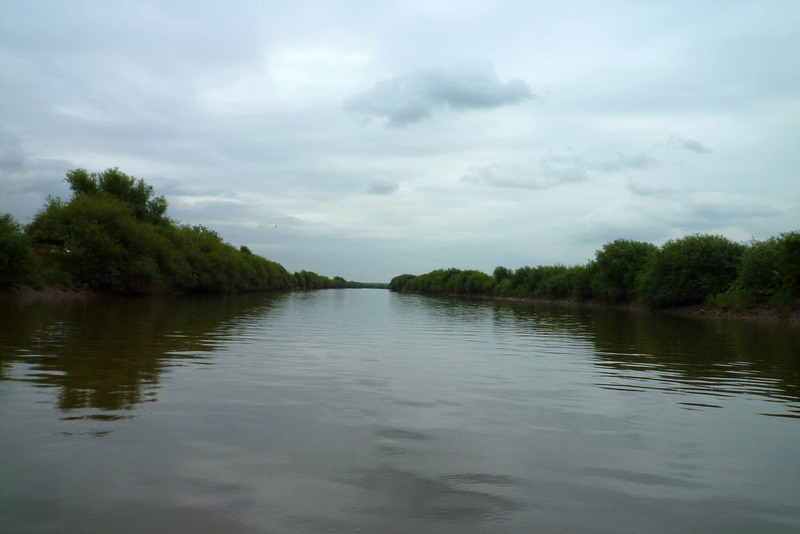 We’d hoped to follow them through the navigable channel as they’re about four foot deeper than us, but we consulted the charts and found our own way upriver. 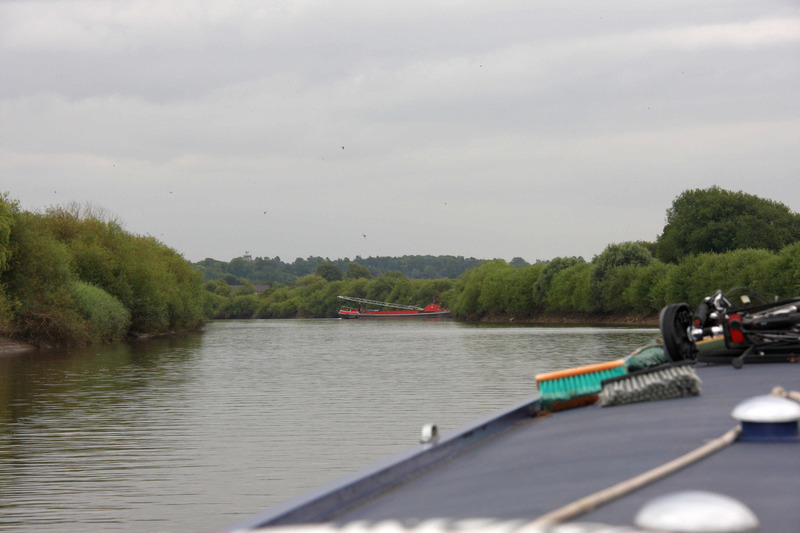 But not for long – we turned around one bend and there it was – the huge dredger that had passed us earlier – apparently aground and at a right angle to the flow. 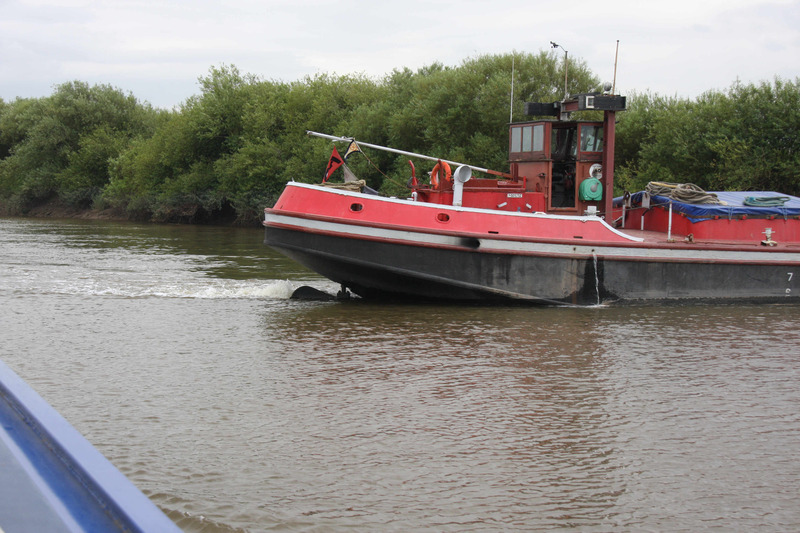 We tried hailing it on the VHF (channel 6 & 74) but got no reply – a quick inspection via our binoculars showed that the wheelhouse was empty, but then we saw the dredger bucket being used. 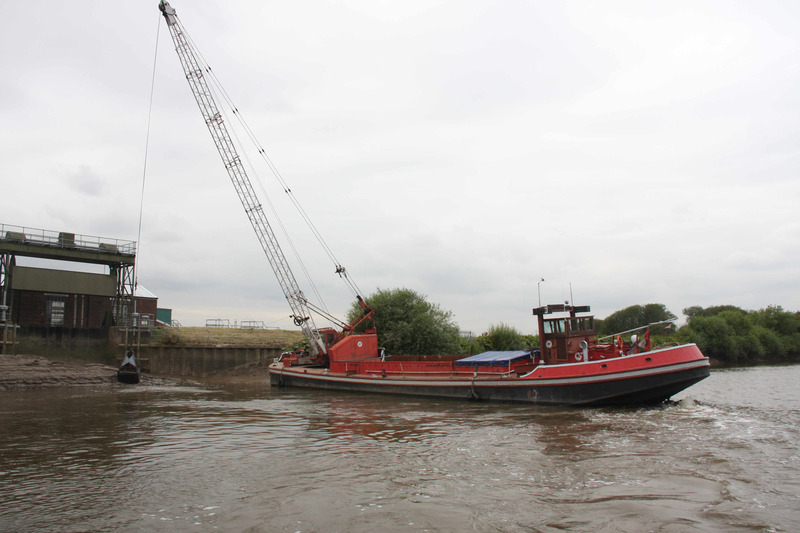 The dredger had grounded its bow in the bank and was running its engine in gear to stay in place. 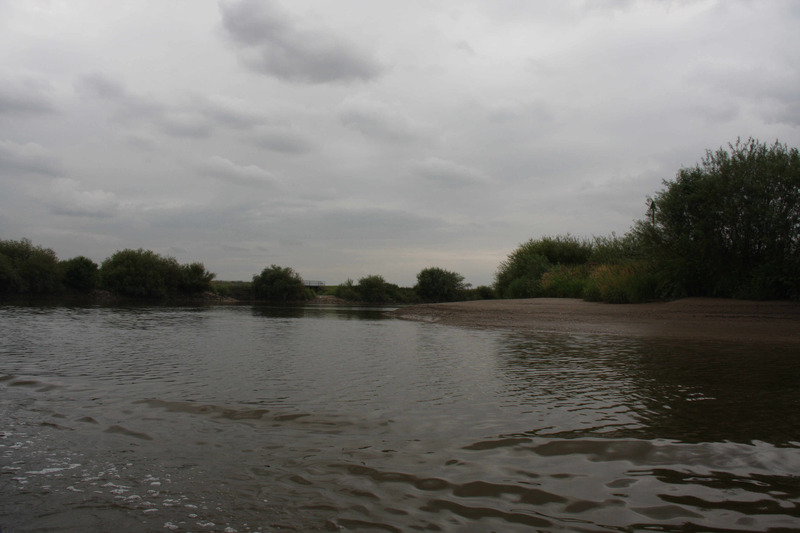 It seemed that we had no option but to creep past its stern – hoping that the flow from its propeller wouldn’t put us into shallow water. 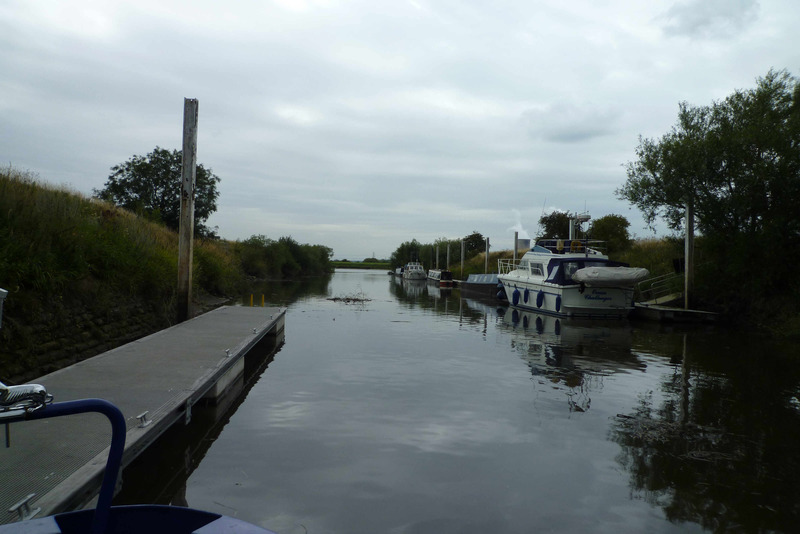 We really enjoyed this section of the tideway, marvelling again at Gainsborough’s waterfront – its high walls and wharves are so evocative – you can just imagine big ships working here. 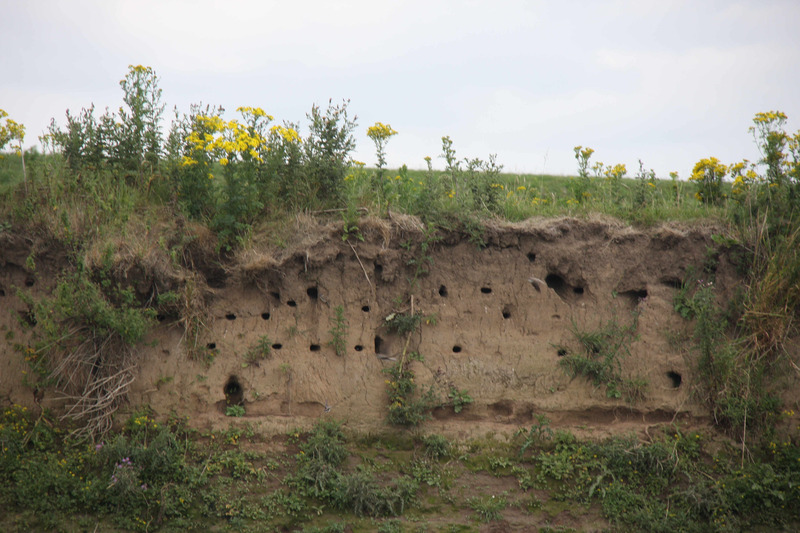 But we were soon back in the countryside and I wondered at the sight of sand martins flitting in and out of their nesting holes. It’s not a sight I see every day. 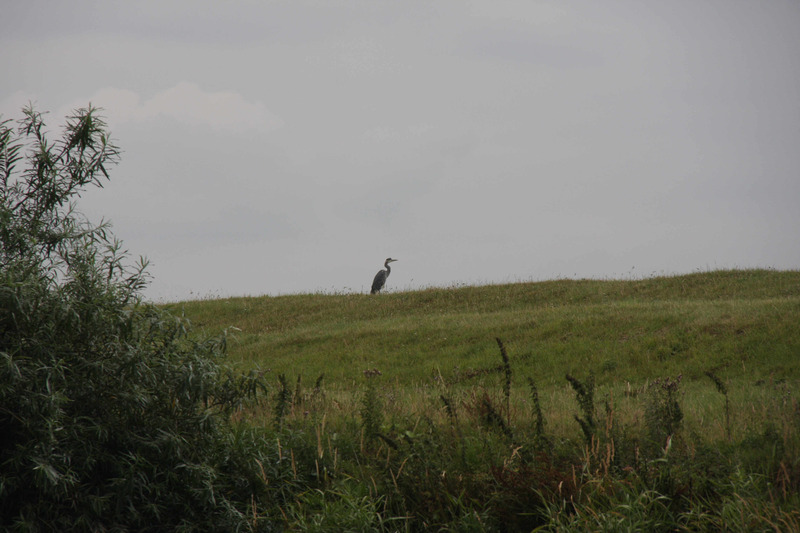 Or maybe not - what's that dredger up to? 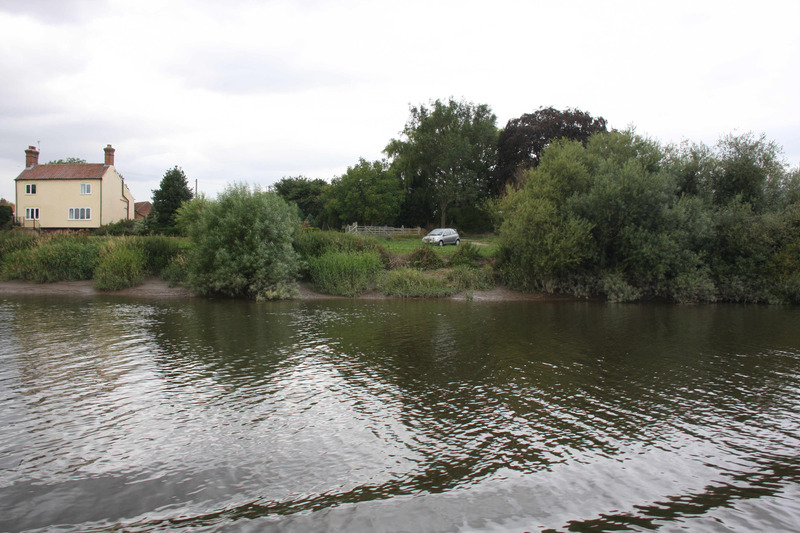 Although we were a little concerned, we passed the dredger without incident and pressed on up the tideway – we passed Laleham Reach without running aground – there are shallows on both sides of the river with the channel roughly in the centre – the man who lives in the house overlooking the river says that cruisers often go too far over to the outside of the bend and regularly ground there. 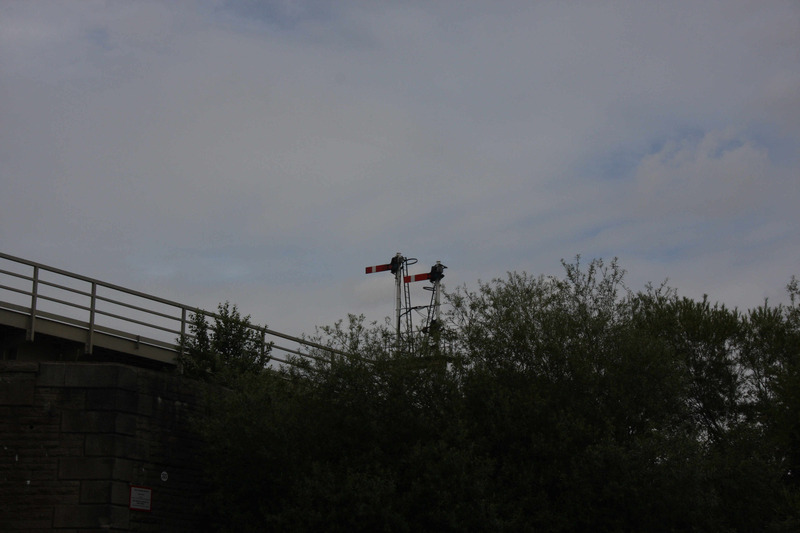 I was interested by the railway bridge crossing the river past Gainsborough – it’s looking a bit weary and had old-fashioned paddle signals – we were speculating whether the line was disused but then we saw a 2-carriage train crossing – there’s our answer then! Unfortunately Lou wasn’t well on our trip – we’re not sure what was amiss – she was panting and restless, which is very unlike her. 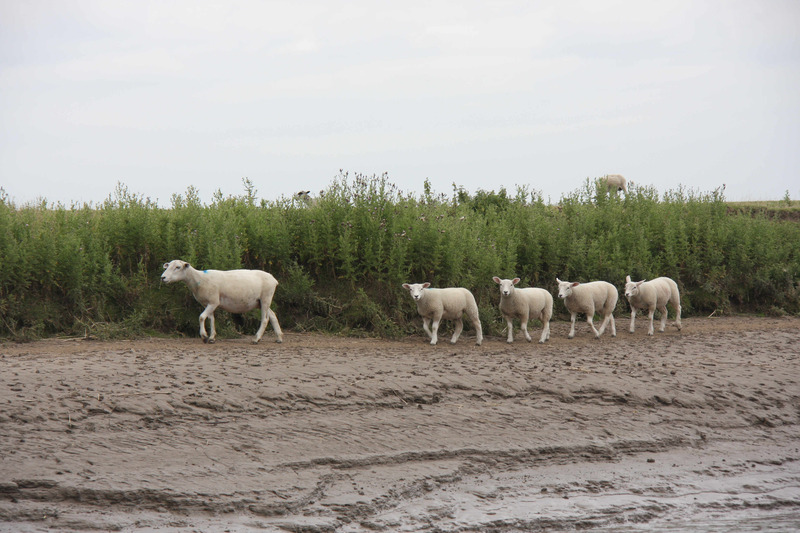 We were desperate to moor up so we could let her off and we could do a proper inspection. 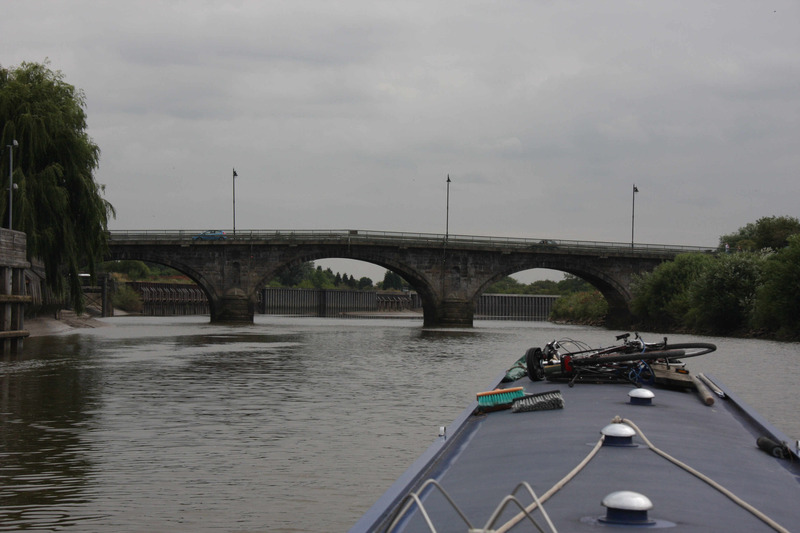 So it was that we had a quick trip up the tideway – apart from the dredger we had the river to ourselves and soon reached Torksey lock. 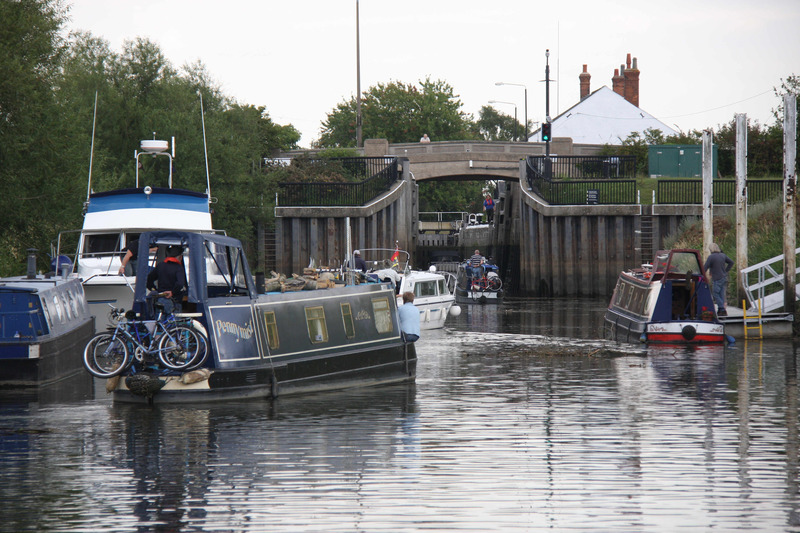 There was a boat coming out of the lock and a surprising number waiting on the pontoons to go in. 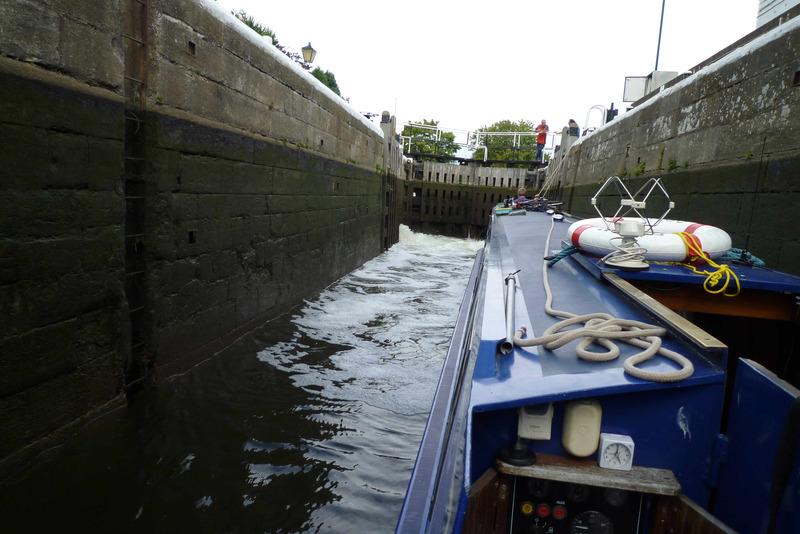 We moored up on the right- hand pontoon – this is a lock landing only – the ones on the right are a 48-hour mooring. With a low tide, the slipway was very steep but Lou and Lynx were able to get off for a bobble. We never did work out what was amiss with Lou – maybe she was just in a bit of pain from her various joint/muscle ailments. 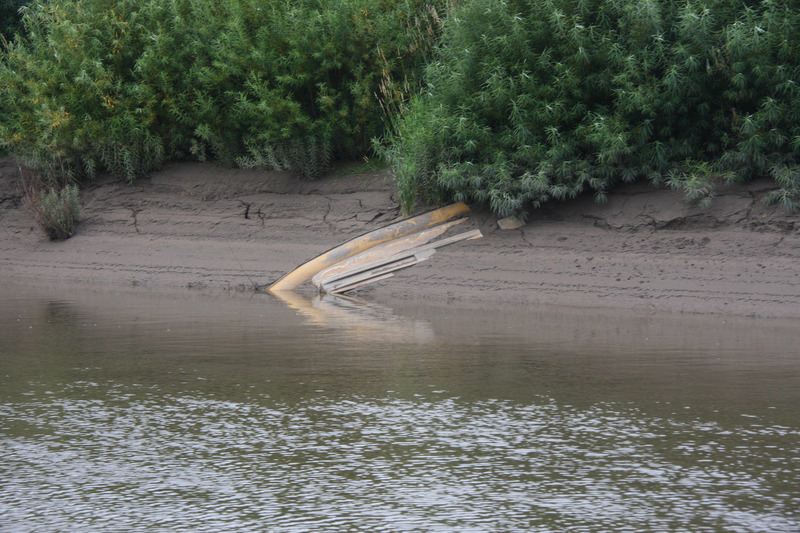 I wonder what's embedded in that mud? 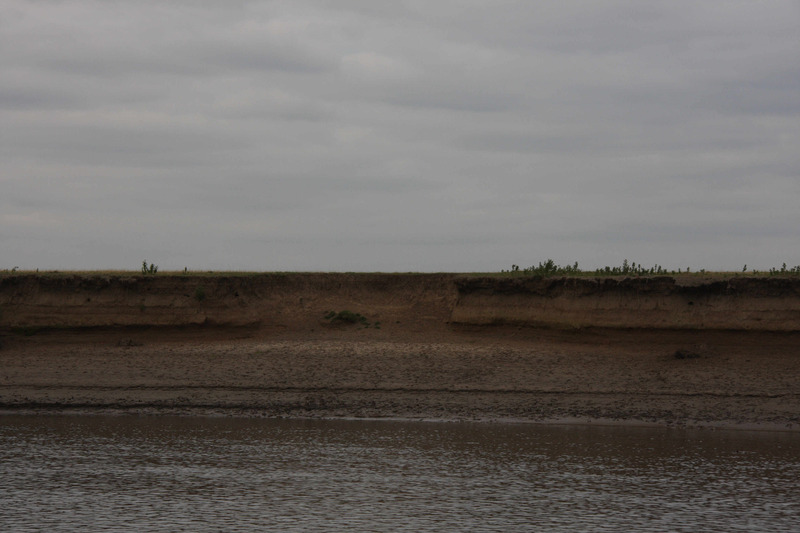 I wonder what caused this bit of erosion? 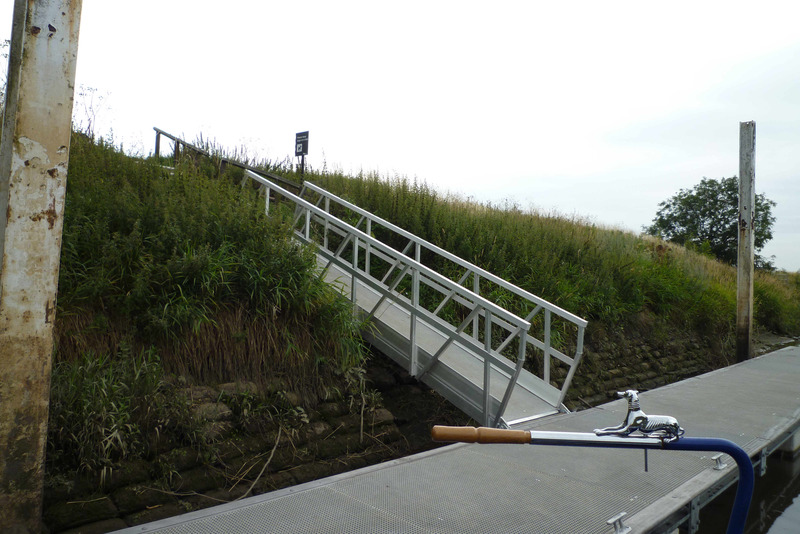 The lock moorings at Torksey - good spot to get the hounds off while waiting for the lock - wouldn't want that ramp any steeper though!